The Mourning Dove is an abundant and widespread terrestrial bird breeding from southern Canada, across the United States to Central America and the Caribbean. It utilizes a variety of habitats across Tennessee. It can be found in both rural and urban landscapes, nests readily around yards and farmsteads, and is a frequent visitor to bird feeders. The distinctive mournful song gives this species its name, however, some people mistaken this call for an owl. Description: The head of this medium-sized bird is small with a black comma-shaped spot below and behind the eye, the body is light brown, the tail is long and pointed and has white outer edges. The wings have black spots and whistle in flight. The male and female are similar in appearance, but the male is slightly larger and slightly more colorful with a bluish crown and pink chest. Voice: The song is a melancholy cooing of 5 notes, the second higher pitched, followed by three repeated notes: ooAH cooo oo oo This mournful song is often mistaken for an owl. When alarmed the wings produce a whistle upon takeoff. Rock Pigeons are larger and chunkier, the wings are broader, and the tail is square. Eurasian Collared-Doves are also slender, but are larger and heavier, the tail is long but square with white corners, and they have a black collar across the back of the neck. Habitat: Breeds in variety of open habitats, including agricultural areas, open woods, deserts, forest edges, cities and suburbs. Nesting and reproduction: Peak nesting is from April to August, but Mourning Doves have been found nesting in Tennessee in every month of the year and they can produce multiple broods. As with other pigeons and doves, both parents feed newly hatched young on "crop milk," a unique secretion of the cells of the crop wall. Incubation: Incubation of the eggs is by both parents and lasts for 13 to 14 days. Fledging: The young are fed "crop milk," a nutritious fluid produced by both parents. Young leave the nest in 12 to 15 days and are tended by the male for an additional week. Nest: The female builds the nest with the male bringing her sticks. It is a flimsy platform of twigs, often sparse enough to see the eggs from below. The nest is placed in deciduous or coniferous trees, tangles of shrubs, or vines, occasionally on the deserted nest of another species, and sometimes on a rock ledge or other structure. Nests are frequently reused. 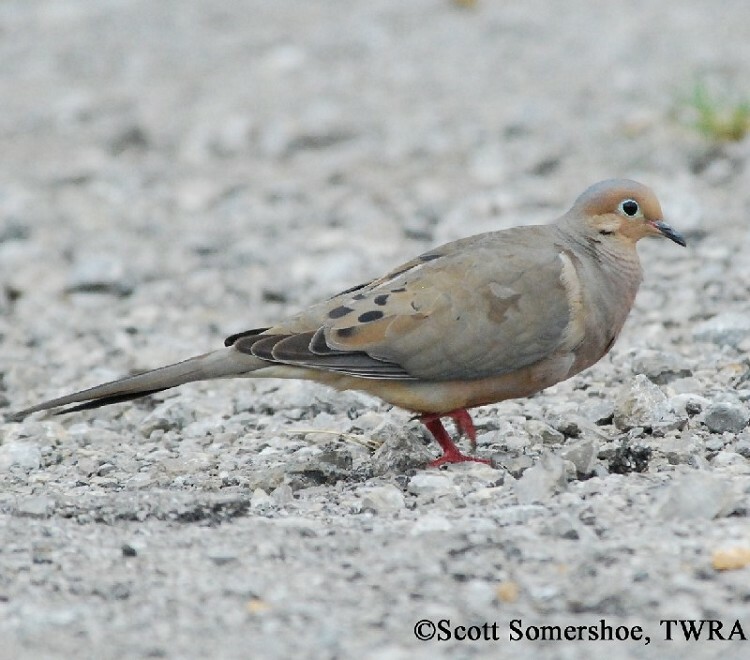 Status in Tennessee: The Mourning Dove is a familiar, abundant, resident across the state. Birds migrating here from more northerly latitudes augment the winter population. 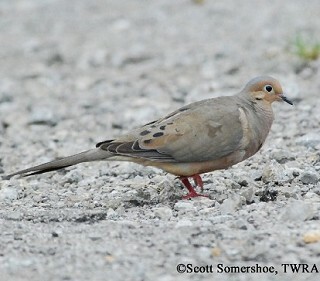 The Mourning Dove is the most popular game species in Tennessee. From 1981 to 1990, an average of 141,000 hunters harvested an average of almost 3 million doves per year in the state. The population in Tennessee is generally stable. In Tennessee, Mourning Doves have been found nesting in every month of the year. Mourning Doves, like most doves, lay no more than two eggs, but may have up to 5 or 6 clutches in a single year. The Mourning Dove is a popular game species. Despite being hunted throughout most of its range, it remains among the 10 most abundant birds in the United States, with a population estimated at 350 million individuals. Otis, David L., John H. Schulz, David Miller, R. E. Mirarchi and T. S. Baskett. 2008. Mourning Dove (Zenaida macroura), The Birds of North America, (A. Poole and F. Gill, eds.). The Academy of Natural Sciences, Philadelphia, PA, and The American Ornithologists' Union, Washington, D.C.